Our email marketing software create and manage as many address books as you’d like from your Newsletter2Go account. This means that you can enter contacts in several address books, and then manage them all independently of one another. Contacts can unsubscribe from one address book and stay subscribed to others. You can create and manage as many address books as you’d like from your Newsletter2Go account. 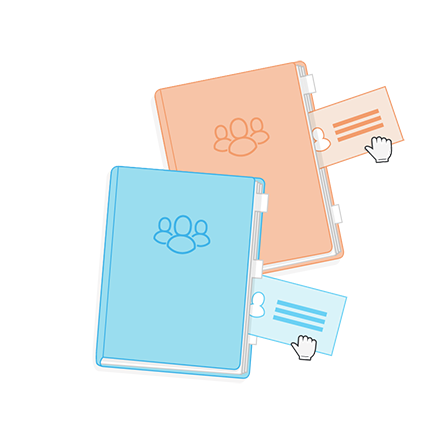 This means that you can enter contacts in several address books, and then manage them all independently of one another. The address books remain independent of one another, meaning that changes to one will not affect the others. This could be useful to manage different groups of customers or for agencies who would like to manage their clients’ accounts from a central account. Here’s an example to illustrate how the feature works: if some of your online shops customers register for your bags newsletter and others registered for the clothing newsletter, these two groups can be managed completely independently from one another. Separate address books make newsletter management easy. Signups and unsubscribes from one address book are not carried over into others, which means that if contacts decide to opt out from one address book, they will continue receiving email campaigns from other address books. Moreover, you will enjoy more our reporting tools combined with separate address books. Each report is based on the individual address book. Obviously, the same goes for contact and product synchronization via various newsletter plugins. Once the plugin is set up, the data is only imported into a single address book of your choice. If you wish to set up a plugin to synchronize with several address books, you’ll then need to set up the connection to each address book individually. The separate address book is a very useful feature in contact management. If you’d like to make most of our email marketing software and manage seamlessly address books and contacts, learn about recipient management and group management. Use this newsletter software feature to manage more than one e-commerce site or website sections from a single Newsletter2Go account. You won’t ever have to set up separate email marketing accounts for separate divisions of your business, because each division can have its own address book in your account. Learn how our newsletter tool will help your sales grow.